A delicious mixture of sweet, sticky teriyaki chicken, crunchy cucumber and perfectly seasoned rice. 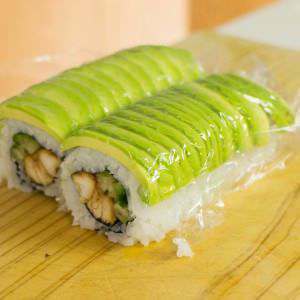 The topping with soft avocado adds a real twist to the texture and flavour of this sushi roll. Serve as bite-sized canapés or sophisticated finger food. Before you start, prepare or buy teriyaki sauce, 120 grams (4 oz) of sushi rice and about ten thin cucumber batons. Put one teaspoon of sesame oil and two teaspoons of olive oil in a frying pan and turn on the heat. 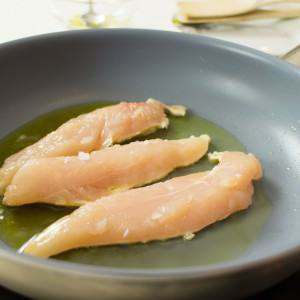 Take a piece of chicken breast, slice it lenghtwise in two or three pieces (for one roll you need two pieces of about 3 to 4 cm wide) and sprinkle a pinch of sea salt on one side. Put the salted sides face down in the pan and sprinke the other side with a pinch of salt too. You can check if the chicken breast is fully cooked by poking a skewer into the thickest part. Observe the juice that will drip out. It should be clear and not show any sign of pink. The most reliable way is to use a cooking thermometer. Stick it at the centre of the thickest part. When the temperature has reached 75 degrees Celsius (167 degrees Fahrenheit), the chicken meat is fully cooked. Once the chicken is cooked through, drizzle thick teriyaki sauce over the meat. Let it simmer for a few minutes to infuse the chicken breast with the teriyaki flavor. Then remove the teriyaki chicken from the pan and put in on a plate to cool. This is going to be an inside out (urumaki) roll. 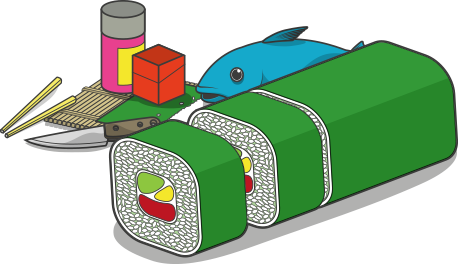 If you’ve never done this before, click here for a beginners guide to rolling a sushi roll. Place your bamboo rolling mat inside a plastic zip-lock food bag to prevent the rice sticking to the rivets of the mat. Lay a half sheet of nori on the mat, with the rough side of the nori facing upwards. Now moisten your hands with some water and rice vinegar to make it easier to handle the rice. 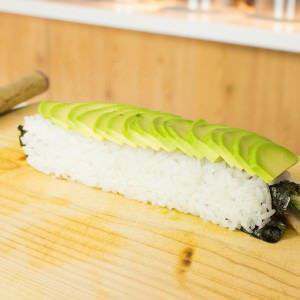 Spread 120 grams of sushi rice across the surface of the nori sheet and into all the corners. Handle the rice gently so that it remains fluffy and light. Then flip the sheet over so that the rice is facing the rolling mat. Take two pieces of the teriyaki chicken breast and place them lengthwise at the centre of the nori sheet. Put a few cucumber batons on top of the chicken. Don’t add to many, that would make it hard to roll the roll. Now drizzle a bit of teriyaki sauce over the cucumber and chicken. The amount depends on your own preference, but don’t use too much otherwise the roll will become all wet. Pull up the end of the bamboo mat closest to you and and curle it over the filling in the centre of the roll. 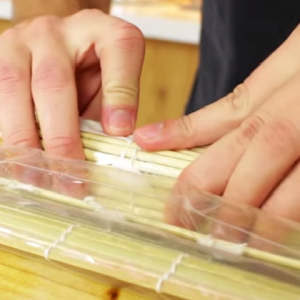 Compress it all together as you roll by applying pressure on the bamboo mat with your hands. Release the pressure slightly once it is all rolled up, take the mat off the roll, push the roll a bit forwards and compress again while squeezing gently. Repeat this action two or three times until the roll is tight and the rice neatly compacted. Take a half peeled avocado and slice it up in thin slices (of about 1 mm). Use only the tip of your knife and drag it quickly through the avocado. By only using the tip of the knife, you will achieve a neater cut, as the avocado is less likely to stick to the knife. Spread the avocado thinly on the chopping board. 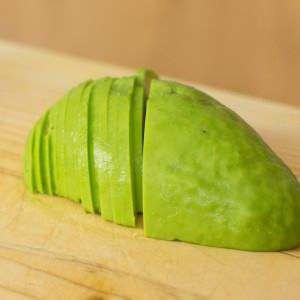 Flatten them down a bit with your hands and trim the sides of the avodo (in particular the pointed edges) with a knife to make them look neat and uniform. If you’ve flattened the slices correctly you should be able to do this in one movement. Put your sushi roll back on the chopping board. Scoop up the avocado slices by sliding the flat side of a knife underneath. Place the slices on top of the sushi roll. Take a sheet of cling film and lighty cover your sushi roll. Place the bamboo rolling mat (this time without the plastic bag covering) on top and gently apply pressure to further shape the roll. Remove the mat but leave the cling film in place. Moisten your knife by drawing it across a dampened cloth. This prevents the rice from sticking to the blade. Cut the roll in half and place both halves side by side. Cut each half into 4 pieces. (If you want really neat pieces, first cut off both ends of the roll and eat them right away to have a taste of what’s to come.) Keep moistening your knife between cuts. When the cutting is done, gently remove the cling film. Arrange the sushi pieces neatly on a plate and add a scoop of pickled ginger at the side. Drizzle some teriyaki sauce over the sushi pieces. Finish by sprinkling toasted sesame seeds over the roll for added crunch. 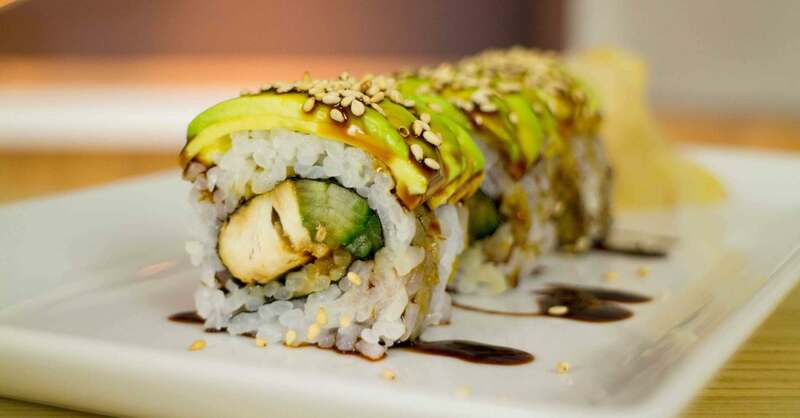 You are now ready to enjoy this beautiful teriyaki chicken sushi roll!